The Kamshet West Tunnel or Kamshet I tunnel is 1.843 km long road network tunnel situated near Kamshet in Pune Maharashtra. 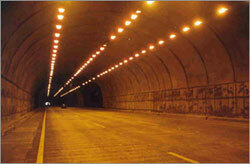 The longest road tunnel in Maharashtra has 2 tubes with 3 lanes lies on amazing Mumbai Pune Expressway. The Mumbai Pune Expressway is the Indias first six lane concrete tolled expressway with a distance of 93 km and one of the best too. Maharashtra will soon have the eight kilometer long tunnel, the second longest tunnel in the country that will connect Khopoli to Lonavla.